Authorities are puzzled by the lack of clues in the fatal motor vehicle accident that claimed the life of local investigator, Eddie Chekhov*. 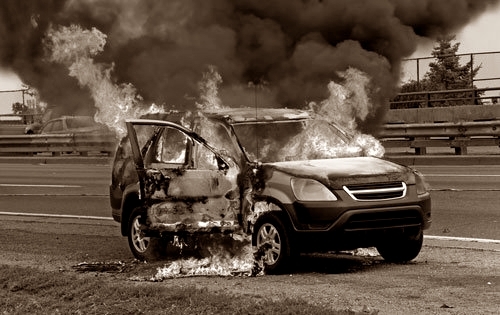 Mr Chekhov's vehicle was found engulfed in flames on the side of the road early yesterday evening. Although early in the investigation, it has been revealed that there were no likely explanations for the accident. No other vehicles had been seen on the road prior to discovery of Mr Chekhov's SUV, nor was there any indication of a collision. Mr Chekhov was identified through dental remains. Police appeal for any witnesses to come forward. Yeah, as if that was going to happen! Mrs Milfoy has nothing to worry about, at least as far as devices hidden in her clock/radio. Of course there was nothing inside. Poll results indicate that 80% of respondents probably could do with their own tinfoil helmets. I've upgraded my tin foil hat, I lined it with baking paper for added protection.